The Bird's nest differs from many in appearance because of it's spear like shaped leaves rather than feather or palm like fronds. The leaves (have a brown mid-rib and wavy margin) grow up to about 2ft long from a rosette of fronds where new leaves appear when the plant is producing new growth. Care level: The two main conditions to provide well is enough humidity and to protect the leaves from direct sunlight (they become scorched), although some sunlight is ideal for them. If a person has sufficient living space and can follow the straight forward care instructions below, anyone can grow and maintain them. Temperature: Room temperatures between 65-75ºF (18-24ºC) are ideal, and no lower than 55ºF (13ºC). Light: Most books and guides will agree that bright light without direct sunlight should be provided. However, providing some direct sunlight is great for the Bird's nest fern to grow well, but you need to only provide some morning or a small amount of pre-sunset. The fronds can become pale or have scorch marks on them if the sun is too hot. During the winter the sun is much less harmful to the plant. Watering: This is a species that loves it's soil to remain moist at all times, but not soggy. Water around the edge of the center rosette to avoid the water becoming stagnant in the center, which may cause rot. Soil: A peat based potting mix is required. 2 parts peat and 1 part perlite (maybe a little less) is one mixture that will be fine. A peat based mixture with organic material is also good. Fertilizer: From April - September feed the plant with a weak diluted fertilizer every 2 weeks to encourage new growth and healthy looking leaves. 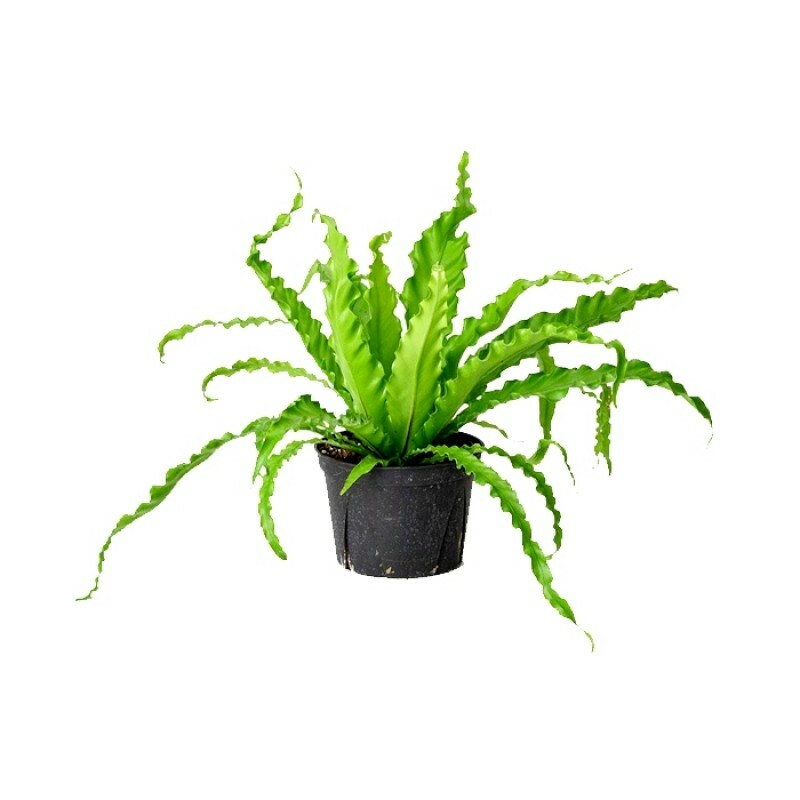 Re-Potting: The Asplenium nidus does not need a pot change very often because it's roots are very small. Once every 2 years is advised for a mature species and once a year while it's young. These do not generally have a problem with becoming root bound, but have more of an issue with staying stable in the pot - this is because the roots are small and they're usually attached to a tree making their own mount. Watch out to see if the plant is becoming unstable and move to a larger pot if it is. Humidity: Humidity may need to be improved if it becomes low and the plant is showing signs of being affected by dry air. You can improve the humidity by standing the plant in a humidity tray, a tray of peat moss or use an electronic humidifier. Propagation: These are propagated by spore sowing which is very difficult for the average indoor grower to carry out. Many ferns can be propagated by division, not this species though.